Parryphonalia is a four piece folk group, all accomplished musicians who have performed in the Wellington region, nationally and further afield. When they get together, something magic happens. 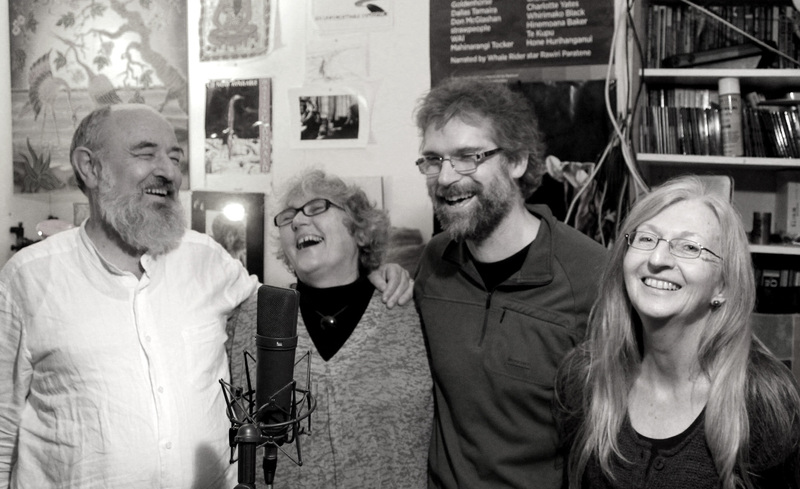 They bring tight vocal harmonies and a collection of new and old instruments to traditional and modern folk songs. Parryphonalia is: Nigel Parry, rapidly becoming an established player in the Wellington region with a strong mellow voice and sympathetic guitar playing. Philippa Boy, a multi-instrumentalist who has appeared on stage and in film. She plays traditional hurdy-gurdy, ocarina, clog fiddle and sings too. Susan Rose brings her clear soprano voice to Parryphonalia and also performs with Sage and 10DD. Niels Gedge is a well known musician and performer with an engaging bass vocal style. Julian Ward plays ‘harp like guitar’ with Nigel Parry, The Short Blacks and Kaboodle. He specialises in open and modal tunings.